Knowing how to grill a good burger should be your first priority if you are just learning how to become a grill master. 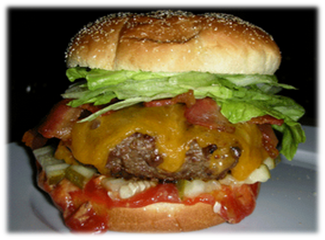 A hamburger may not be considered a gourmet meal by any stretch, but there are some basic techniques that need to be followed to ensure you get a juicy, tasty result. First, make sure you buy 80/20 ground beef. If you purchase 93+ lean ground beef, it will tend to dry out on the grill because there is not enough fat in the meat. 80/20 will ensure there is enough fat in your meat and is the preferred ground beef by all grill masters. Next, make sure you don't ever push down on your hamburger with a spatula while it is on the grill. All this will do is make the juices run out of the meat instead of staying locked inside to add to the tenderness of the burger. Many beginners find themselves doing this spatula technique because they don't form their burgers correctly and are trying to flatten them out. Make sure you form your hamburgers fairly flat and then stick your thumb in the center of the burger to make an indentation. This indentation will give your burger something to expand into during the grilling process, instead of turning into a meatball. Turn on your grill and set it up for medium-high direct grilling. Put your ground beef in a bowl and mix in all of the dry seasoning ingredients and Worcestershire sauce together. Blend all of the seasonings throughout the meat evenly and form into hamburger patties. You should have about 3 hamburger patties per pound. Place your hamburgers directly on the grill and close the lid. If you are wanting to top your burger with an onion, place the whole 1/2 onion on the grill at this time. Your onion will absorb the smokey flavor from the grill and also bring out the natural flavor as it cooks. Burgers typically take about 12 minutes on the grill, but vary depending on how big you made your patties and how well done you like your burger. You should be prepared to turn the burgers 45 degrees half way through cooking it on each side. Turning is different than flipping your burger over. Turning will help your burgers cook more evenly, especially if there are any hot spots in your grill. Remember that you can toast your buns when the burgers are about 3/4 of the way done. We also recommend putting the cheese on the burger while it is still on the grill in order to melt it to perfection. It will take about 1 minute to fully melt the cheese. If you talk to any experienced grill master, they will tell you that they can just look at a burger to know when it is done. It takes some experience in order to learn exactly when to pull them off the grill. If you are new to grilling, there are a few techniques you can employ in order to make sure you don't feed your guests a burger that is still mooing. Generally speaking, the firmer the patty is the more done it is. Also, you can use our meat temperature chart and a meat thermometer in order to check for doneness.